Lost Levels :: View topic - So I think I have 2 games that have never been dumped... Lost Levels - A website about unreleased video games. Greetings everyone. So I am an American collector who has been living in Korea for a few years. For those who are not familiar with Korean retro games, it's a wild scene. For example, up until the Gamecube era, Nintendo games and systems were sold by Hyundai. The Super Nintendo in Korea was rebranded as the Hyundai Super Comboy! BUT ANYWAYS, to the point. I have two games that I believe to be undumped. Thought this was the perfect place to get info on how to preserve these games for the ages. 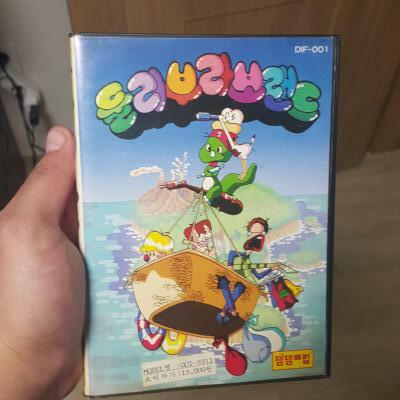 The first game is Dooly Bravo Land for the Famicom. Dooly was a very popular Korean made cartoon character from the 80s. He has a game for the master system and MSX, but those have both been preserved and dumped already I believe. According to hardcoregaming101, the Famicom one has yet to be preserved and I have a CIB copy in my collection. The second game is called Sky Fighter. It was released in 1990 by a company called 'Clover Soft'. They mainly dealt with MSX stuff, but ported tons of the games to the master system (Samsung Gam*Boy or Samsung Aladdin Boy in Korea). Again, according to hardcoregaming101, this game has yet to be preserved and the only proof of it's existence was a small title screen pic from an old magazine advertisement. There is a high chance that it's a stolen game with a changed splash screen, but I don't know enough about old MSX games to be able to confirm that. I can provide proof of ownership when I get home from work. The only pics I have of the items now don't have proper time stamps and proof of ownership. I can share some video of the game play or anything else you guys want too. But what I really want to know is how I can get these games properly preserved without compromising the integrity of the games. I would like to keep these in my collection, but it feels selfish to not get these preserved. I welcome all advice. Thanks guys! There's a SMS rom available for a port of the Konami MSX game Sky Jaguar. 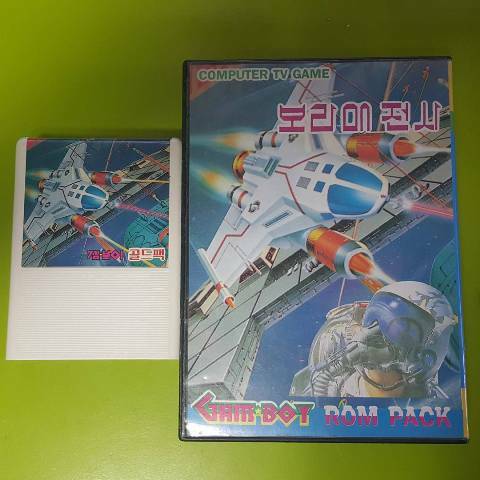 Rom auditing software labels it as Korean, so maybe it's the same game as Sky Fighter? If you can provide a screenshot it'd be easier to say. Interesting! But are you saying that this is an MSX cart (as is indicated on HG101) or an SMS version? In any case, I'm reasonably familiar with the MSX library, but this game doesn't seem to correspond to any one thing. I ran through all of the shooters listed on Tagoo (the big Japanese MSX database) just to be sure, but no dice. What it really seems to be is a weird amalgamation of elements from Xevious and Zanac, with possibly some other stuff thrown in as well. The music also sounds infuriatingly familiar to me, but maybe I'm missing something here...? If it is indeed an SMS cart, I'm sure the guys over at SMS Power can help you with preserving it. Sky Fighter is an MSX game. What model MSX do you have? From asking around just now, it seems like a fairly simple thing to do with some software and a disk drive, I can try to help. Great news on Dooly. I TENTATIVELY have a copy coming to me on loan (along with Googoo), but I haven't 100% secured it yet, so it would be great if I had you as a backup plan. If you'd be willing to mail and loan yours to me in the U.S. I will get it dumped, though I should warn you in advance that opening up the shell and looking at the board is probably going to be necessary. In fact, I would suggest you work on opening it up yourself, so you're not trusting someone else to do that to your item. I may be out of my depth here, but as I understand it, I remember reading that there is some sort of roughly shared system architecture between the MSX1, the ColecoVision, and the Master System, and as a result, there are a TON of (I assume unofficial?) specifically made-in-Korea MSX1-to-Master System ports floating around online. I would be willing to send Dooly to the USA for sure. And to make it easy on your end, I could just have you send it back to my parent's house in NJ. I actually have little experience with opening FC carts though. Last time I tried I cracked all of the tabs. I'd trust a professional over myself in that department. Could you answer a quick question? Were any of the Comboy64 games in Korean, or were they all either English or Japanese? I believe that all of the Comboy 64 games were just the North American versions in Korean shells / packaging. I also believe that only 4 games were released which were Mario 64, Mario Kart 64, Star Fox 64 and Diddy Kong Racing. I've had all 4 pass through my shop and they were all in English. Of course the manuals and inserts were all in Korean though. There were a few "Asian Version" games that came out here, but those were simply the American releases with stickers on the outer box. No changes in the box, cart or inserts with these. There is sadly no Korean database (at least that I know of) for any of this stuff. It seems like all of the work to archive this information is being done by foreign collectors. Our friends in France are doing a particularly amazing job with this. This is Omar/Bock from SMS Power! we exchanged some e-mails yesterday. With those MSX1 conversion there is a small chance that the ROM image may actually even dual boot on SMS and MSX1. The cartridge won't work on a MSX1 but some ROM images have been prepared to work on both systems with the appropriate boards and connectors different in each version. Presumably they did this to save on making different roms? FYI for all those Korean games (regardless of whether it happens to be MSX1 compatible) there's zero need to open the cartridge to make a dump. I can't tell about the Famicom one however! Interesting stuff! Also happy to know that the cartridge wont need to be opened. Excited to see this get dumped finally. I have a question for you, if you have the time. In your travels there, have you ever come across any of the obscure Apple II games from the early days of the Korean gaming scene? "Sin'geom-ul Jeonseol" at least has been preserved, but the handful of others seem to be lost. I would basically be willing to crawl over broken glass to see Topia's "Hokseong Daetalchul" found and preserved, in particular. The other Aproman releases like "Uju Jeonsa Dooly" (is it a law in Korea that there has to be an undumped Dooly game for every platform?) and "Miss Apple" are also high on my wishlist. Despite the fact that I always seem to end up posting on Atari or Nintendo-oriented sites, my main personal interest is the Apple II, so any help would be greatly appreciated. I'm kind of surprised if so many unlicensed Korean SMS games used a standardized mapper. Well, the SMS already has scanline interrupts and can only use VRAM for tiles, so all that is needed in a mapper is banking ROM. But the rule of thumb in Korea is the older the item, the more likely it ended up in the trash. Koreans had way different priorities back in the day since they were still a developing nation. One of the MANY reasons that retro games ( and other pop culture goodies) are so hard to come by here. It's what also makes it so interesting to me. If you think the world of Korean retro gaming is wacky then you should check out some of the bootleg toys from here back in the day! So is anybody trying to dump both things? Sky Fighter is being sent out soon to get dumped. Dooly was already in the works of getting dumped apparently though. Dooley Bravo World, Magic Kid Googoo and Koko Adventure are all on their way to Kevtris as of this morning. Koko Adventure was dumped back in 2011 IIRC. Because it was on a NonGoodNES pack Kamming published that year. Oh well, I guess it's gonna get dumped again.